Get an air heater and Y it into the existing ducting. Heating sea water to recoup the heat via heat pump is folly. I would add a resistance heater to the AC unit....much like mermaid or flagship do. I wonder if a closed loop system would do the job and let it heat the water itself? "Every Day is a Holiday and every Meal is a Feast"
Not practical... but how it's done and it works? Look at an ice skating rink. Everything has heat in it. even ice. heating the water to heat it is expensive redundancy. Just use gas or diesel heater in the boat if it gets cold enough to ice damage the inside of the (where you can't see) heat exchanger . close loop would get cold until it started freezeing. 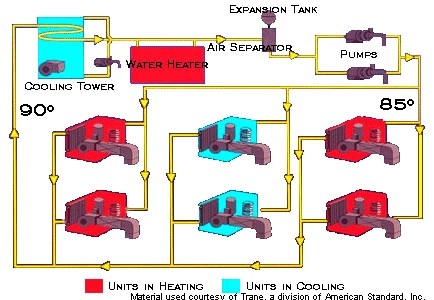 Larger systems, the closed loops (like a ship or high rise bldg) have heating and cooling sources. It will heat the water if in the cooling mode, however in the heat mode, it will cool the water, actually remove heat. Not trying to be cute but it is important to remember there is no such thing as cold, it's all heat, cooling means removing heat. A heat pump works of course by moving heat, either into the boat from seawater when in the heat mode or removing it from the boat and dumping it into seawater when in the cool mode. The colder the water gets, the less heat there is to move of course, and the less heat is removed, but I believe what actually causes them to stop working at some set water temp is the water actually freezes in the condenser, blocking flow of course. Its sort of like light, there is no such thing as dark, just the absence of light. May sound like I'm making a play on words, but if you understand that there is no dark, then you understand why we can make a flashlight, but can't make a dark projector. We have a hydronic heater. We have a heat exchanger for the hydronic system in the return air duct of the A/C system. In the winter we can run the hydronic system and turn on the A/C fan. This heats the entire boat from the hydronic system using the A/C to distribute the warm air. The hydronic system has its own thermostat to control cabin temperature. So we just use the A/C for warm air distribution. I am considering living on my 53' Carver in the New York area. I'm also looking into using a diesel fired hydronic heater to warm the seawater going to the reverse cycle AC/heating system. Anyone have any thoughts? I'd like to keep it simple. For the opposite reason, we use a potable water tank for one of our air/water refrigeration units to have cooler water for the condenser when in warm raw water environments. It also greatly reduces maintenance and corrosion in the coolant loop. This is nearly equivalent to lifting oneself by the boot straps. It defies what a heat pump does on a basic level. Also you have considerable exposure to serious freeze damage if the power fails for any reason (you will not be winterized). This is perhaps the main reason I dislike heat pumps in clod climates; they fail right when you need them most. Either add resistance heating to the air handler or add a separate heat system. Fuel would be better, as it works away from the dock and is redundant. Probably cheaper than a custom bodge. Understand your problem, Have you found a solution? I have been looking some into it myself. I guess you are asking for Ideas to raise your inlet temp above minimum temp for your heaters, for them to work. So you want is to raise the temperature to above 4,4deg celsius. (approx 40 F). The water under the boat might be to cold, the temperatur is normally a few degree warmer deeper, it might not be enough at your location, but worth a check! You need to measure the temperature further below during winter to check if high enough temperature deeper down, before purchasing anything. The de-icer uses approx 500W, but it will lift the temperature under the hole length of the boat. to lift the temperatur a few degrees, (self regulating heat cable) kicks in 7, deg C and cut of at 13 deg C. (45-55F) Can see on my original hoses it need to have good size to allow for nough flow, so this hose in the link are to small. I got heat in the engine room, so it might be ok with a house without heating!!?? Or buy a cheap water boiler, to put in line with the seawater. (guess you need to throw it after 1 winter season). I have bought a de-icer, (For removal of ice) but still not cold enough in the water to measure how much higher temperature there are deeper below during winter season. But however it might rice the temperatur 4 deg C (6F) under the hole boat, so I might use it even if its not "good" enough. This might help me rise the temperature in an heater inside my engine room. But I need to find a solution soon, hopefully you have one? There are losses in heating water, to extract the heat from the water for the heat pump to put into the boat, so just as a pure guess to move 16,000 BTU of heat out of the water, you going to have to put 20,000 BTU into the water? That is hundreds of time more heat than you can get from a heated water hose. But I like your idea of moving warm water from the bottom, but am confused as I thought is the water were warmer below, it would rise on its own from convection? I think if you have a very efficient heat pump, you can get one ton, 12,000 BTU for about 1,000 watts. So your going to be well north of that to heat water, much more efficient I believe to burn that power heating the air in the boat directly from a resistance heater, I like the oil filled ones that look like an old fashioned radiator, as you can knock one over, lay a towel on it etc and it won't start a fire. The water in the summer time is hotter in the surface (due to air temperature and sun), and colder deeper. But in the wintertime the surface water is colder (due to airtemperature and lack of sun) and normal temperature deeper are approx 4deg Celsius. a little bit to low (6F) for the aircon for heating. The De-icer propellor will lift the "warm" water up. But this might not be enough, so an additional 1-2 degres to be added via the "Garden hose" in the engine room!...this few degrees extra could be enough to use the cruiseairs onboard. Replace your a/c heating unit with a Flagship Marine unit. The Flagship a/c side is conventional reverse cycle just like you have now. The heat side is pure electric furnace. No additional throughulls, piping or duct work needed, just use your existing stuff. I've run Flagship units for 20yrs. as a liveaboard in Toronto and burned two $20.00 relays in that time and have never been cold. So, the OP hasn't responded since Aug. I wonder how he's making out with his preheater.